Jay Foreman was an intimidating presence at linebacker for the Nebraska Cornhuskers. A four year starter there, Jay finished with 233 tackles, ranking him 12th best in school history. 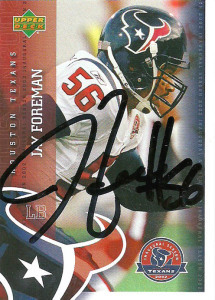 Taken in the 5th round of the 1999 draft, Foreman was inactive for a good portion of his rookie season due to a logger jam at linebacker on the team. He’d play on special teams in the final 4 games of the season. It wasn’t really until 2001 that Foreman got his chance to shine for the Bills. The team converted to the 4-3 defense and kicked Sam Cowart inside, leaving 2 spots to be fought over at outside linebacker. The big loser was John Holecek, a stalwart defender who found himself surprisingly cut due to the Bills precarious salary cap situation. Foreman was supposed to battle it out with Kenyatta Wright and Jeremy Spoon for the backup job at MLB to Cowart, but by the beginning of the season, Foreman was starting at right linebacker for the Bills. He’d have a pretty respectable season with 72 tackles, 2.5 sacks and 2 fumble recoveries, – right in time for a new contract. The Bills, still contractually herniated needed to figure out to do with Jay. Enter the Houston Texans. The rookie Texans became a dumping ground of sorts for bloated contracts to go to die, while alleviating much needed cap space for the teams who gave up players. With the expansion draft underway the Texans selected offensive back Charlie Rogers with the 11th pick. The Bills had pined for Rogers, put some calls into the Texans, and before everybody knew it, the trade was consummated. Foreman was a steal for the Texans, as he’d have his best season as a pro officially recording 137 tackles (197 by Texans’ coach estimates) at LILB. He’d post another good season for the team before injuries limited him to 11 games in 2004. After the ’04 season, the Texans coaching staff blew up the defense trying to go younger, and allowed both Foreman and Jamie Sharper to explore trade options after the team signed Morlon Greenwood. Unable to find a trade partner, both players were eventually cut. Foreman went on to play two more forgetable seasons for the New York Giants and San Fransisco 49ers before finally retiring. I had heard that Jay was appearing at a Texans Ambassador appearance in East Texas, and with Lance going, I went ahead and exercised one of my future options. I sent him a few cards for both myself and him to get signed and crossed my fingers that everything would work out. Overall a pretty nice card, and I am glad to get Jay’s autograph on it. I would love to eventually complete this set out, but many members of the expansion Texans franchise roster has already slipped under the radar.